We are a unique name in the industry to provide our precious clients an exclusive range of Cabinet Tower Bolt. Offered bolt is precisely manufactured by our adept professionals using the best grade raw material and advanced technology. Owing to its corrosion resistance and durable finish, this tower bolt is highly demanded among our clients. Further, in order to ensure the best quality, the provided tower bolt is stringently tested by our quality experts on various quality parameters. “New Navtan Brass Industries” is a Jamnagar (Gujarat, India) based Sole Proprietorship (Individual) organization. 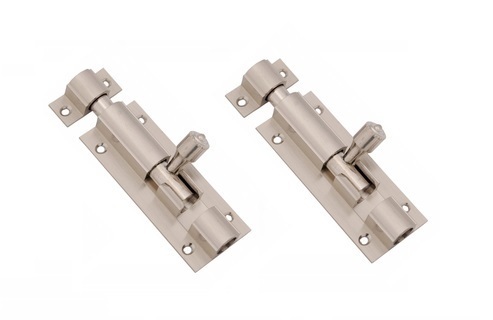 From the time of establishment of our company in the year 1985, we are engaged in manufacturing, exporting and supplying a wide gamut of Brass Baby Latch, Tower Bolt, Brass Hinges, Glass Bracket, Iron Nail and many more products. The raw material that is used by our adept professionals in the manufacturing process of these products is sourced from our reliable vendors. In order to design all products in line with the set international quality norms, our professionals utilize contemporary technology. These products are made available in a wide range of specifications like sizes, dimensions and material grades that can be modified by our experts. All these quality assured products are widely known in the market owing to their superb features like accurate dimensions, durability, sturdiness, high strength and hassle free installation.